Advent is a time of quiet waiting with Mary our Blessed Lady. We wait in joyful hope for the coming of our Lord and Saviour, Jesus Christ. Mary was a woman of prayer, a woman steeped in the knowledge of God. Mary gave us a great prayer as an example for us to follow God. It is the Magnificat. (Lk 1:46 -55). "for the Almighty has done great things for me. Holy is his name." I love these lines that Mary spoke to her cousin Elizabeth when she visited her. I find them powerful lines and a gift from our Blessed Lady to us all. These lines are not just Mary's lines, they can be ours also. Man is by nature and vocation a religious being. Coming from God, going toward God, man lives a fully human life only if he freely lives by his bond with God. Cf(CCC 44) When we acknowledge God as our Creator and Lord we are free to see things as Mary, our Blessed Lady did. We are born with a soul, a part of us that longs for God. The 'soul' signifies the spiritual principle in man. Cf (CCC 363). God has created us and breathed his spirit into us, He has made us in His image and likeness. Why does our soul not proclaim His greatness? and why does our spirit not rejoice in Him, our Saviour? "My soul proclaims the greatness of the Lord and my spirit rejoices in God my saviour." I ask myself, do I proclaim how great God is to myself and to those I meet each day. How many times do I even think of God in my day let alone proclaim his greatness? How can I proclaim his greatness? God's greatness is all around us. It is in the air that I breath, it is in the very body that I live in. God's greatness is in every human being, every creature he has ever created. It is in the world of nature all around us. God's greatness is so vast that it is beyond us and yet when we do get a small glimpse of it our souls do rejoice in God our Saviour. Today is a day set out for rejoicing in God, a day where we can remember all the mighty things God has done for us. Our very breath that we breath is God's gift to us. Jesus Christ, the Son of God, is also God's gift to us all, His gift of salvation. He has given us his only Son, Jesus Christ so that we might have life eternal. This is the ultimate Christmas Gift given to us from a King, a holy King. I sometimes wonder if I really do grasp all that the almighty has done for me and I think the answer would have to be no. God is so vast, so mighty, so beyond us and again it is his gift of faith that enables us to encounter Him and communicate with Him. Holy indeed is His name. 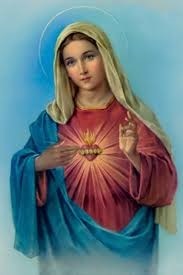 If I were to grasp all that the Almighty has done for me then like our Blessed Lady, Mary, my soul would proclaim the greatness of the Lord and my spirit would rejoice in God my Saviour. This Advent, make time to ponder on the great things that the Almighty has done for you and how Holy his name really is and by Christmas your soul should be rejoicing in God your Saviour. Our Blessed Lady while in this world always prayed. Images handed down from Sacred Tradition show her deep in prayer meditating on the word of God. From an early age Mary pondered the things of Heaven. Her mind was fixed on God alone. Mary the all-holy ever-virgin Mother of God, is the master work of the mission of the Son and the Spirit in the fulness of time. The Holy Spirit prepared Mary by his grace. In Mary, the Holy Spirit fulfills the plan of the Father's loving goodness and in Mary the Holy Spirit manifests the Son of the Father, now become the son of the Virgin. Filled with the Holy Spirit Our Blessed Lady, Mary, makes the Word visible in the humility of his flesh. Through Mary, the HolySpirit begins to bring men, the objects of God's merciful love, into communion with Christ. Cf. (CCC721 - 725). Mary's prayer is revealed to us at the dawning of the fullness of time. Before the incarnation of the Son of God, and before the outpouring of the Holy Spirit, her prayer co-operates in a unique way with the Father's plan of loving kindness. Cf. (CCC 2617). If one looks at the life of Mary in the mysteries of the Holy Rosary one will see that at every moment Mary's gaze and focus was fixed on her Son Jesus Christ. At the Annunciation Mary was open to the things of Heaven and to doing the will of God. In the visitation to her cousin Elizabeth it was not Mary or Elizabeth who were the center of attention. It was her unborn child "The Christ" whom they both spoke about and all praise was given to God the Father in Heaven. In the third joyful mystery, the Birth of Christ, Mary in all humility fades into the background and all eyes are focused on the new born babe who has come down from Heaven. Visitors come to pay homage and to worship the Son of God made man. In the presentation of the Child Jesus again all Mary's focus is on doing the will of God, the things of Heaven. When Jesus is lost Mary and Joseph spend three days searching for Him once again Heaven is the centre of their attention. In the mysteries of Light, at the Wedding Feast at Cana, Mary reaches out to her Son Jesus Christ in faith. When the wine runs out Mary does not look to man to solve the problem but looks to one who came down from Heaven her Son Jesus Christ. In the Sorowful Mysteries of the Holy Rosary probably the most pictured moment in history is the image of Our Blessed Lady gazing at her Son Jesus on the cross. At a moment in time when all the world's anger is unleashed on her beloved Son Jesus Christ and he hangs on a cross waiting to die, Mary stands by and gazes upon Heaven. Her attention is clearly on her Son and not on what humanity has done to him. At no point does Mary lash out in anger, she keeps her focus centred on her Son Jesus Christ and the will of God the Father in Heaven. 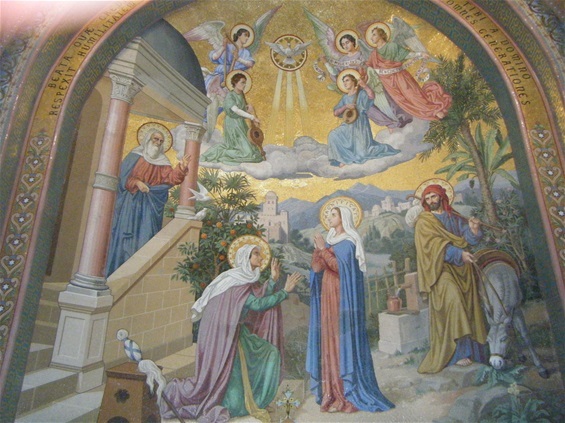 In the glorious mysteries, the descent of the Holy Spirit on the Apostles shows Mary waiting patiently for God's Spirit to descend upon her and as a reward for her faithfulness to God in the final two Glorious mysteries, Mary is assumed into Heaven and crowned Queen. Cf. (CCC 2617, 2618) The prayers of the Virgin Mary, in her Fiat and Magnificat, are characterized by the generous offering of her whole being in faith. Cf. (CCC2622). Let us learn from the example of Mary. Like Mary, may we too seek the things of Heaven. The desire for God is written in the human heart, because man is created by God and for God; and God never ceases to draw man to himself. Only in God will he find the truth and happiness he never stops searching for. The dignity of man rests above all on the fact that he is called to communion with God. Man cannot live fully according to truth unless he freely acknowledges that love and entrusts himself to his creator. Cf. (CCC 27). Mary knew and understood these truths and that is why she was able to continually focus on the things of Heaven even in the most difficult of times and situations. Our Lady of tears, help us to focus on the things of Heaven and to forget all earthly things that pull us away from God. Amen.